Good morning fellow crafters & welcome to Day 2 of the Authentique & Taylored Expressions Blog Hop! If you came here from Stephanie Kraft's blog then you're on the right track. Make sure you began today's hop with the Taylored Expressions blog & that if you see something you like along the way, please feel free to leave comments! Comments are always more than welcome. 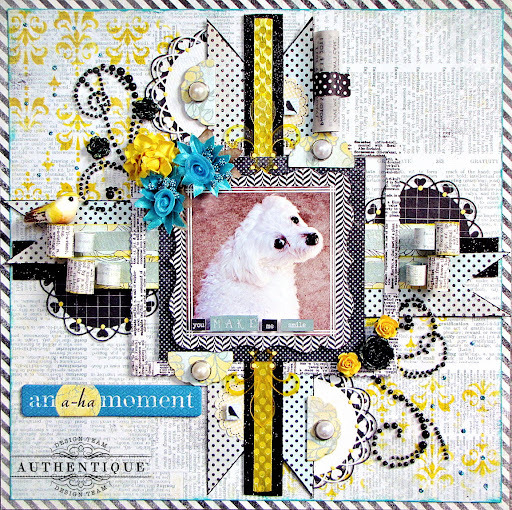 For my project, I decided to combine Taylored Expressions 'Keeping Tabs Die' & 'Layering Doily Die - Medium' with Authentique's Renew collection. This would be my little guy Toby giving me one of his over the shoulder looks! I was finally able to capture this infamous move of his with my camera & this was the perfect project to showcase it. The fabulous soft turquoise, yellow & black color scheme of the Renew collection made for a 'playful' page which is the feeling I wanted this page to convey. Here you can see both dies by Taylored Expressions layered. I first ran through the doily die--cut the die in half and simply flipped one half of the circle die over. I then offset the two layers just slightly so that the black would peek through from behind the white side. Next I layered the 'Keeping Tabs Die' which I accentuated by applying a large brad through it. I did a bit of paper rolling as seen here to give the page a bit of dimension. Here's the 'Layering Doily Die' once again by it's own. I just added a bit of pastel yellow acrylic paint dots to the hearts in order to dress it up a bit. I felt that one of these rolls made for a perfect nest for this little guy! So I adhered him right onto one of the largest rolls. I added a large brad to the center of each one of the 'Keeping Tabs Die'. This formed a kind of symetrical design on my page that happened purely by accident! :-) When I finished & looked at the page from afar I noticed it. These clear Fleur-d-Lis embellishments are by Clear Scraps. I highlighted the border with a yellow Sharpie paint pen and added a few dots of yellow acrylic paint to them. These bright turquoise organza star flowers are from my stash. I have many of these in several colors which I currently have up for grabs in my small Etsy shop. The background was made with one of Clear Scraps most recent releases--a 6" Damask Mascil. I used Mustard Seed Distress Ink and heavily applied it to my mask because I wanted the image of the mask to display brightly. I then further decorated the background with random dots of turquoise Stickles. Just in case, here's todays blog hop order--your next stop is Sankari's blog. Thanks for stopping by & enjoy the rest of the hop!